I have been waiting for thunder to come out with a new product for ions! Waiting, waiting patiently, not knowing what i was initially hoping for. V2 are a very innovative and ever changing company, and everything i have wanted so far, including mini strongs and long portions have come to fruition. so what's next for one of the largest discount snus makers? White portions of course! Snus girl was soo excited about this, as she is a white portion kinda girl. Me? i like em dark, strong and straight on the gums for maximum tobacco absorption and burn. Normally i would turn my nose up at anything white portion, but its thunder so i was a little curious and also excited. You can tell its a V2 product just from the can. I read around the forums that these are bulk made in china cans that anyone can buy. 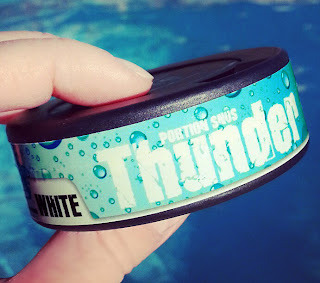 This made me laugh, I really dont care what my snus is packaged in as long as the product itself is good and thunder never disappoints me! What is cool and different though is the label. A light blue and bubbly design that stands out from the rest of the usual product line. The new white portions come in three varieties: Cool Mint, Wintergreen and Frosted. It is said that cool mint and wintergreen are limited edition items and may or may not be continued on. I hope they are, the more snus choices we have available the better. The smell of cool mint is unlike frosted. It has more of a chewing gum spearmint flavor that you don't get with frosted. its stong, but not overpowering and the tobacco still comes through in a rich peppermint tone. The portion size itself is regular. I know a lot of people are going to want these in strong minis. That would make it perfect for work and other discreet situations, but since i work from home, im happy to have a fat snus lip. The white material itself is slightly more irritating then regular portions, but that comes with the territory, as with everything there is a trade off. The nicotine level is at 16 mg's which is the same as the regular thunder portion. You definitely feel the nic hit and are not wanting another portion for a good long while. Try it before its all gone!